What a beautiful, timely post! Every year, my husband and I visit Apple Hill in Placerville, California. We are long overdue for a box of apples and apple pies for the holidays. I would love to try your recipe! Sounds more classy than plain apple fritters. Thank sounds absolutely wonderful – I need to do that! Would love to know what you make with all of your apples. Thank you so much for stopping by. Happy holidays! Gorgeous, I fell in love with Beignets in New Orleans, Cafe du Monde. They are wonderful. I love your caramelized apple cider dipping sauce. Just beautiful. 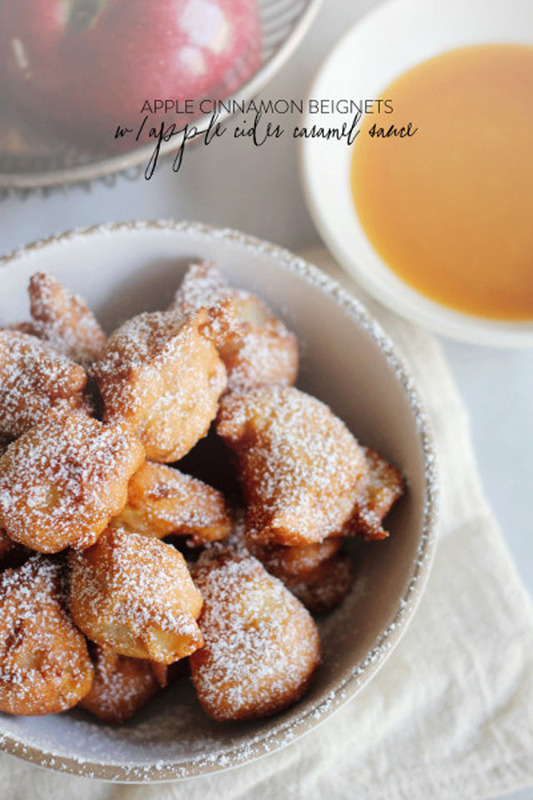 Apple beignets sound pretty stunning in themselves. But the dipped in a caramel sauce – truly wonderful. Gorgeous photo too – so hard to make fried food look as good as it tastes. Thank you so much Skye! Isn’t that the truth – so hard to make these little beignets photograph well – I felt like how good these little guys looked in person was not being properly conveyed! 🙂 Thank you very much for your kind words.